Hello Ladies! I hope you all had a great weekend. I definitely did. Feeling very blessed. So today I wanted to share with you some pictures of outfits a few of the girl’s wore to our organization’s convention last weekend. I wish I had better pictures to really give these outfits justice, but these will have to do. I hope you like. Modest, unique and stylish! Aren’t these girls lovely? Melissa, wearing the light blue/mint ruffle dress, sewed that up all by her lonesome. I thought she looked cute. Karen and Wendy (from the right to left) are wearing dresses as long shirts. And Julie, in the aqua blue dress, you can’t really see her, but It’s one of my favourites that she owns, a very pretty dress on her (which she got at Old Navy). This is Johanna, I love this outfit on her. Very stylish. 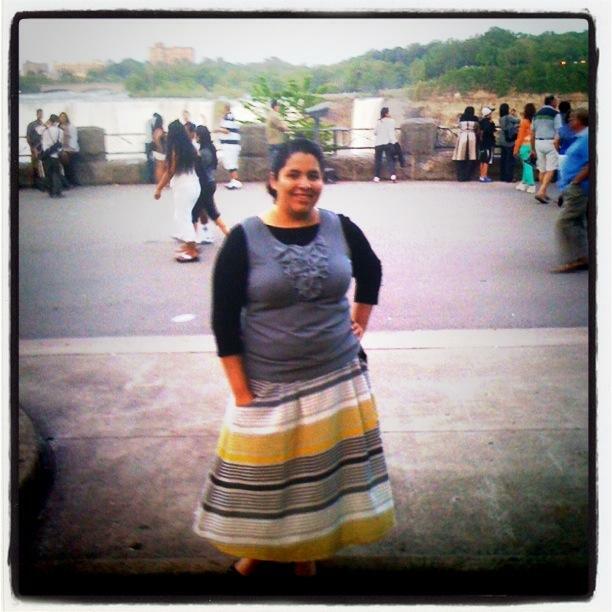 If I'm not mistaken the skirt is from Old Navy. This is Jenny, Jenny might not be happy with this picture, but it’s the only one I could find of her in that skirt! (Forgive me Jenny). But I really loved that skirt, It’s way more beautiful in person. It’s rare to find skirts like these and she wore it quite well. The store where she got it from is in Toronto and they sell a wide array of beautiful long skirts, but they are very pricey! However, on a good day, you can score a deal on the sales rack. I once bought a very beautiful skirt from there. It cost me $80.00. Wow, I KNOW shame on me. But it was beautiful. Sadly it doesn’t fit anymore. LOL…. And last but not least, this is what yours truly wore on Saturday Night. I happen to really like this outfit, it was comfy and modest. I bought the shawl at winners (made the flowers! ), the ruffle blouse inside, I bought once at a trip to Montreal and my new favourite blue pencil skirt, I got it made. Next Event.. we should partner up. eh? 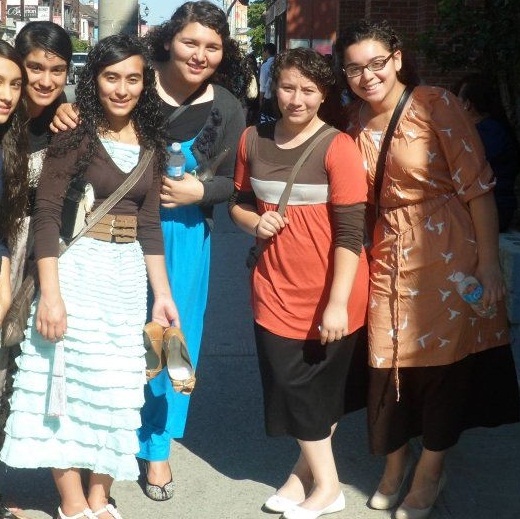 I'm looking for Christian ladies that believe to dress modest and feminine to make some sort of a convention or gathering to be a help to ladies in my community.